OUR PRICE: $22.00 - Join Rewards Get $2 Dance Dollars On This Item! So Danca's #1 selling ballet slipper! Beautifully made "Bliss" ballet shoes feature a stretch canvas fabric that adheres perfectly to the arch without gaping on the sides, a split sole, and elastic binding for added support. Suggested Fitting: .5 to 1 size lower than street. Best shoe I’ve tried yet! I have been taking dance for about 4-5 years now and have ALWAYS loved this brand! I’ve tried a ton of different brands and styles and these have always been the best! I wear a street shoe size 9 1/2 and couldn’t remember what size my slippers were from the last time, so I looked at reviews and everywhere I could to see what people with bigger feet got and couldn’t find much so I just kinda winged it 😅 - I have extremely wide feet and long toes and decided to get the 8.5 B and they fit perfect! The box was rather beaten up but the shoes are fine and fit great!! These fit like a glove - I'm never going back to non-stretchy canvas or drawstrings! The footpad works well for me, too, as it sits nicely under the ball of the foot. No pleats on the bottom to catch on the floor. I noticed such a difference in my turns the first time I wore these. I wore through the first pair quickly, but I think that's just a trade-off for the nice feel of the thin, stretchy canvas. This is my go to pair of ballet shoes. I’ve been wearing them for years and they are so comfortable and make my feet feel amazing. Super light and stay on your feet really well. I had to return these for a bigger size, but they're great shoes! I wear a 8 street shoe and ordered the 5.5B after reading another review, but my toes didn't have enough space. The 6.0B was a much better fit! These shoes always look great! I'm a professional dancer and I love these shoes, but the sizing chart is way off. I wear a size 8 women's street shoe, and wear a 5.5 in these shoes. My friend wears a 7.5 women's street shoe and wears a 4.5 in these shoes. I ordered a 7.5 and they were ENORMOUS. I'd worn these shoes in the past, but the insides of the shoes are not labeled in any way, which makes it difficult to reorder accurately if it's been a while and you've forgotten your size, or are trying to guess based on the sizing chart. This shoe is perfect for me. I have wanted to try a pair of ballet slippers without the stringtie, so I purchased these. They look nice and are comfortable. My daughter has tried several brands, but this is the best for her. Wow...my first impression of so danca is wow! I took these shoes out of the package, put them on and they were perfect. So comfortable and soft. Fit my foot perfectly with no gappage at all. I found my new flat! Thanks So Danca and thanks DDS! I thought I would give these a try although I've never worn anything by Sodanca. However I'm very glad I did as these shoes are incredibly comfortable and mold to the foot. I didn't realize what nice arches I have until I tried these on. The split sole patches are also sturdy with quite a bit of springy "squish" to keep your heels and metatarsals from aching hard surfaces. I highly recommend these shoes. Not as great as I thought, too big, and just did not fit well! The design for these ballet shoes is great! No drawstring, yet the edge is very flexible. The canvas is flexible and comfortable. I am typically a size 6.5 in street shoes, and I get these in a size 6B, so they do run a little bit small. The fabric is not very tough, and I have to get new pairs once every month and a half. I dance 5 days a week (at least 12 hours a week), and they only last for about 6 weeks. Otherwise, these are great shoes! They are always my go to and I would never switch to a different type. The shoes were purchased for my soon-to-be 11 years old daughter. She has Bloch leather shoes required by studio. We bought the stretchable canvas shoes for practice. We tried them at store and compared the shoes side by side. She wears 3.5 street size. Bloch 3.5B fits her nicely. However for So Danca, we had to go by size 5. The stretchy canvas and no drawstrings, all these nice things make the shoes fit so comfortable. It also compliments arches as well as the overall look of feet. Highly recommend the. True to size, but it's all a bit of a gamble. These were for an 8.5 year old boy, wears 4 street. So same as a girl who wears 4 street. So Womens 6 street? Then ordered one half size down - Womens 5.5. These fit well over tights, with barely one half size to grow, if that. Recommend. It's great that this shoe comes with the elastic already sewn into the shoes, which makes it very convenient. Just put them on and dance! I found these shoes to run large, which meant I needed to return them and re-order a half size smaller. The other downside was it took 1 month from order to receipt because they were backordered. My 10 y. o. daughter wears 3.5 street size. we ordered 4.5 B and she couldn't even fit in it. Unless you have ordered several pairs and know what size is going to fit you, suggestions that the website provides regarding sizing are completely useless. I have tried so many brands and styles of ballet slipper and I finally found my staple shoe. It is everything I want in a slipper, perfectly form fitting thanks to the slightly stretchy canvas and fits like a glove. There is absolutely no bunching up anywhere, and the elastic replacing the drawstring is just perfect. Its also very flattering on the foot because of all these things! The light pink color blends in so nicely with typical ballet pink tights. The teensiest complaint I have would be the outer sole's edge seems to be a little thick and I feel it against the balls of my feet in petite jumps especially, but once the shoe is worn it flattens out and becomes more comfortable. Im a size 6 street and the 3.5/B fits perfectly. These are my daughters favorite ballet slippers she has ever had. They fit snug and make your foot look beautiful. She also said they are so easy to turn in. This is her new go to ballet shoe! This is the only ballet Shoe I order.It is durable, comfortable and flexes well with my feet. I Will Never Go Back To Drawstrings! These shoes are the best! I love that they stretch and accentuate my feet. I have always been annoyed by drawstrings rubbing against the tops of my feet, but the elastic around the top is very comfy and the fact that the elastics come sewn on is a great perk. I usually wear a ladies 6 in shoes and ordered a 6. They fit perfectly! No complaints here. I've taken classes for 18 years, and am very particular about shoes. I've tried far more brands and types than probably anyone out there. I've got dozens of pairs in my closet that were worn a few times, then tossed. MDM's Elemental had been the most comfortable, but still didn't hit the mark. So Danca is a brand I've often overlooked, yet when my daughter was fitted for new shoes a year ago, this is the one recommended at the dance shop we went to, and she loved them. So I tried a pair for myself. They are ridiculously comfortable. My daughter would wear hers 24-7 if I let her! These shoes are beautiful, move well, give a clean line to the foot, and are durable! I had to wash a pair of hers after she spilled juice on them, and they were fine after washing. I'm still on my first pair, and she's on her third. If she didn't grow the way children do, she'd probably still be on her first pair as well. This is a line to definitely try. 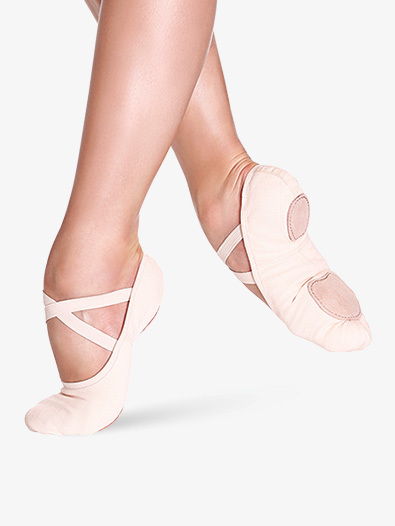 I'll never go back to wearing ballet slippers with elastics after wearing these for the last few years. I absolutely do not miss the irritation of the drawstrings on the top of my foot. These shoes fit like a glove and they're just minimal, great looking shoes, which is all that I've ever wanted from a slipper! LOVE them. An added bonus is that the elastics come pre sewn. It just doesn't get any better! I know it refers to width of shoe. But how does it refer to the width? While online conversion charts can help you get a sense of your size. It's a good idea to get fitted at a professional dance store if you've never purchased shoes before. Please contact our Customer Service line for more assistance. What is a,b,c,d referring to? Width of foot? Yes, that refers to the width of the shoe. Normal shipping through the USPS is 5-7 business days. Please call our customer service line to check on availability and expedited shipping if optional. Are criss-cross elastics already attached, pre-sewn,just provided but not attached? Hello! Thank you for contacting us. The elastics are not attached to the shoes.